After all, they orbit the same sun. Venus is just a bit smaller than Earth. And the two are only about 26 million miles away from each other – veritable next-door neighbors in the cosmos. But other than size and proximity, the two planets have little in common. The surface temperature on Venus is nearly 900 degrees Fahrenheit. (And you thought Florida was hot in the summer.) The atmosphere is almost entirely made of carbon dioxide. In short, astronomers are fairly certain life doesn’t exist on Venus. So, other than perhaps the courtesy title of “sister,” you can cross Venus off the sibling list. In fact, the closest thing Earth may have to a solar system sibling would have to be Mars. While there is still no proof, some scientists believe it’s possible there is some form of life on the Red Planet, although it would almost certainly be microbial – bacteria and viruses than we would refer to on Earth as germs. But astronomers have not given up hope that life – perhaps closer to what we have come to know on Earth — might exist on another planet outside of our solar system. In fact, NASA is taking steps to try to answer that age-old question with its Kepler mission. The Kepler spacecraft is in orbit around the sun, currently about 40 million miles away from Earth. From the spacecraft, the brightness of about 145,000 stars in a swath of the Milky Way Galaxy is being monitored. A very slight reduction in the brightness of an individual star is an indication that a planet might be orbiting around it. Kepler-22b, the first confirmed planet outside our solar system to be orbiting its sun at a distance hospitable to life, is shown here in an artist’s rendering of what it might look like. It is located 600 light years away and its radius is about 2.4 times that of Earth. A “sweet spot” distance between a planet and its sun would increase the chances of the surface temperature on that planet being hospitable to life. That distance – known scientifically as a “habitable zone”– varies based on multiple factors, but a requirement is that water can exist as a liquid on that planet. The Earth is an average of about 93 million miles away from the sun. A total of 105 planets have been found so far that are within the potential “life zone” distance from their sun. That number is expected to rise significantly in the months and years ahead. 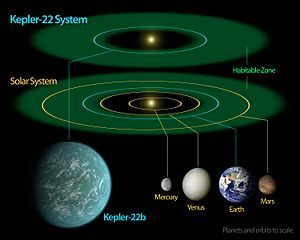 The first of these 105 “confirmed planets” orbiting in this habitable zone is known as Kepler-22b, located about 600 light years from the Earth. About 2,700 stars are being closely studied as possibly having planets that could sustain life. Based on results from the project so far, experts estimate that about 16 percent of stars similar to our sun have a planet similar in size to the Earth orbiting it. So what? Just because a planet orbits a star within a certain range doesn’t prove that life exists on it, let alone any form of intelligent life, right? That’s correct. But as Horch points out, it’s a significant step toward finding out. He notes that astronomers could then hone in more closely on those potential “Earth-like planets” to determine if life is likely, such as by conducting more research on the average density of those planets. And those actions would move us closer, by far, in determining whether or not we are alone in the universe. Do you think life exists on other planets? And if so, is there intelligent life out there? January and February can be a stressful time if you’re a high school senior. The glorious days of fall – when the promise of one’s future is close enough to be exhilarating, but not so close as to be anxiety-inducing – are over. Yet, the inevitable thaw of spring, when college plans are finalized and “senioritis” can set in, is still a few months away. Instead, the cold, hard realities of weather and life coincide — prompting students to choose from among the colleges to which they would like to apply. And while filling out forms can be both tedious and time consuming, the oft-dreaded essay is often the biggest source of stress for students when applying to schools. 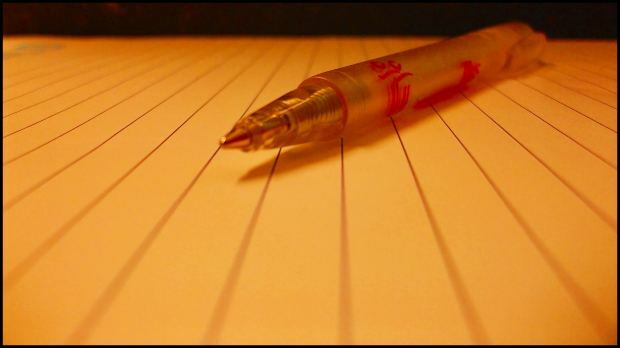 After all, except for the interview that some schools require, the essay is the last opportunity to stand out from the crowd — to show the admissions offices that you are a thoughtful student with good writing skills and are worthy of acceptance. Respond to the topic. You can be the best writer in the world, but if you don’t address the main point or question of the essay, it may not matter. Creativity is encouraged, but don’t stray too far from the topic. Highlight your distinctiveness. Colleges often look for individuals who bring something unusual (in a good way) to the school. If there is an opportunity to talk about your accomplishments, activities or interests, try to include something that sets you apart from most other students. Remember your audience. It’s a good idea to do a little research about the school in terms of its location, values and mission, as well as its academic and athletic offerings. If there is an opportunity to link what you do to what they offer or value, that’s a plus. Mind your grammar, words and humor. Properly delivered, a good sense of humor can be an effective communication device. But a joke or humorous anecdote may not come across the same way in writing as it does verbally. Remember, you can’t use inflection, pitch or other speaking devices in an essay and that can change the context. Also, if you do attempt to use humor, be sure that the comment is tasteful. Write in your own voice. Don’t try to be someone you’re not, or write in a way that is so bland that your voice ceases to come through. Follow the instructions. This applies to the parameters of the essay – length, format, etc. If the application asks for 800 words, don’t submit an essay of 2,500 words. It not only risks putting the readers to sleep, but it calls into question both your ability to comply with basic rules and to outline your thoughts concisely and coherently. Proofread. Everyone makes mistakes in their initial drafts. Even Thomas Jefferson made revisions to his copy when writing the Declaration of Independence. Some readers are less forgiving of typos and other careless errors. You might get away with one or two minor errors, but a pattern of mistakes indicates sloppy work. Most schools don’t want students who don’t pay attention to essential details. Get feedback. Your essay should reflect your own thoughts, in your own voice. But that doesn’t mean you can’t share your drafts with others to get their suggestions on how to improve them. Accept those suggestions that you think make sense and discard those that you don’t like. For those who have read college admission essays – administrators, teachers, parents – what advice would you offer students? *Research conducted by Gene Birz, an assistant professor of economics and finance, was highlighted in a Jan. 17 article in the New Haven Register. The study focused on how newspaper headlines on certain types of economic stories influence the stock market. He found that while there are many variables, headlines that are viewed as positive on stories related to the unemployment rate and the Gross Domestic Product have a positive influence on the stock market. Negative headlines on those types of stories have the opposite effect. *Elliott Horch, associate professor of physics, was featured in the Jan. 6 edition of the New Haven Register as the subject of the lead story in the paper’s Connecticut section. Elliott developed a device that attaches to telescopes and enables astronomers to see images in space much more clearly than previously could have been done with a ground-based telescope. He recently traveled to Hawaii with a team of astronomers to work on the Kepler project, and while there, they used his device to take a closer look at Pluto and its moon, Charon. It’s the night before a big exam and it becomes painfully obvious you are underprepared. We’re not talking about the last minute jitters of a perfectionist who has kept up with their studying. (That person may simply need to give the material one final review or get a couple of questions answered.) No, this is a situation where a few weeks of readings, practice drills and other assignments were neglected — regardless of whether the cause was your own procrastination or because life truly threw you some curve balls. That leaves only three options — beg and plead with your teacher or professor for extra time (generally not a winning strategy), study for a half hour and hope for the best (good luck with that one), or cram. Hey, cramming isn’t so bad, right? It’s just 4 or 6 or 10 hours of concentrated study. And by tomorrow at the same time, it will be over. Most of us have heard the admonitions against cramming — basically that it doesn’t work that well. Yet, faced with the reality that we are not ready for the exam, ‘tis better to cram than not to cram. And sometimes we’re able to cheat the Test Reaper entirely with grades that are as good as usual. But while we may be able to salvage a decent grade with a lengthy, intense night or two of studying, research has demonstrated that it’s a poor long-term learning strategy, according to Cheryl Durwin, assistant chairwoman of Southern’s Psychology Department. The reason has to do with the physiology of how the brain works. Durwin says that when we learn, the information first enters sensory memory. But only that information that we pay attention to and process in some way will get remembered and stored in our working memory. The working memory is what we rely on for tomorrow’s test. “When students cram, they try to stuff too much information into working memory, which typically holds only 5 to 9 chunks of information before it becomes overloaded,” Durwin says. But for long-term learning — the kind needed for cumulative final exams, future courses and life skills — cramming fares even more poorly. To truly retain what we learn for the long run, the information must be stored in our long-term memory. And that just doesn’t happen well when we study something for 24 or 48 hours, and then stop rehearsing it, as we commonly do after a test. And soon the information is lost from the shorter-term working memory. Focus first on material that is close to being learned, but not yet mastered. In other words, stuff you almost know, or mostly know. Then, proceed to increasingly more difficult information. Use any study technique that makes information more meaningful. It might involve making flash cards or writing study notes. But be sure to put information into your own words and generate an example that is familiar and relevant to you. This helps prevent merely parroting words and phrases you do not understand. Create organizational tools, such as timelines, concept maps, bubble maps, flowcharts, compare/contrast charts and diagrams. The better you organize information, the more likely you’ll remember it. What techniques have you found to be useful in preparing for an exam at the 11th hour? Students accepted into a new Ed.D. program in nursing education offered collaboratively by Southern and Western Connecticut State universities can have a portion of their tuition, fees and books paid through a federal loan – most of which is forgivable if they become nursing professors after earning their degree. The U.S. Health Resources and Services Administration has awarded Southern and Western a grant of $98,720 to help students afford the cost for the three-year program that began last September. The Ed.D. (Doctor of Education) initiative is designed to help address the state and national shortage of nursing faculty, which in turn, will help create a greater number of highly qualified nurses. Most doctoral programs in the country fall under the Ph.D. (Doctor of Philosophy) or D.N.P. (Doctor of Nursing Practice) categories. The former focuses on research, while the latter centers on clinical skills. But the Ed.D. program is geared toward developing nursing teachers and is one of only a handful in the country, according to Barbara Aronson, Southern professor of nursing and the university’s Ed.D. program coordinator. Aronson says 18 students registered for the first year of the program – nine based at Southern and nine at Western. Students accepted must have a minimum of a 3.0 GPA in a master’s degree program in nursing from a regionally-accredited institution, as well as a current R.N. license. The Ed.D. requires students to earn 51 credits. The classes will be online. It will take about three years to complete the program on a part-time basis and eventually costs each student about $50,000. Student who participate in the loan program and teach for one year after earning their doctorate will have 20 percent of their loan forgiven. That proportion rises to 40 percent after two years of teaching, 60 percent after three years and 85 percent after four years. Patricia Zibluk, director of Southern’s Sponsored Programs and Research, points out that if 20 students earn their degree in three years, that could translate in up to 80 additional sections (classes) of nursing being taught. “That can have a significant impact on the nursing teaching shortage,” she says. Zibluk also thanks the Health Resources and Services Administration, an agency within the U.S. Department of Health and Human Services, for awarding SCSU and WCSU the grant. Southern also was recently selected for an $80,000 grant from the Robert Wood Johnson Foundation that will enable eight individuals accepted into the university’s Accelerated Career Entry nursing program to receive $10,000 scholarships. The university was among 55 institutions across the country – and one of only two in Connecticut – chosen for the grant. It marks the fourth consecutive year that the foundation has tapped Southern for a grant. It will be awarded to students entering the program during the 2013-14 academic year. ACE is geared to people looking to make a career change into nursing and who already have a bachelor’s degree in another field. The intensive program enables students to earn a Bachelor of Science degree in 12 months, about the half the time it generally takes to earn such a degree at Southern. Megan Rudne Hoffecker and James Hoffecker met as members of the Environmental Futurists, a student group that focuses on improving environmental policies and practices on campus. Now both graduate students, and married to each other, Meg and Jim are working to emphasize to the campus community the value and importance of creating a more sustainable environment.They both are student representatives on the university’s Sustainability Committee, chaired by James Blake, executive vice president, and Robert Sheeley, associate vice president for capital budgeting and facilities operations. This committee, which grew out of Southern’s signing of the American College & University Presidents’ Climate Commitment several years ago, has been charged with making the university carbon-neutral by 2050, no small feat. The Hoffeckers are making strides towards this goal in the work they both do on campus. The interim director of Hickerson Hall, Meg graduated in December with a master’s degree in special education. Jim is working on a master’s degree in history and is currently a student worker who serves on various sustainability projects around campus. He is a staff member of the university’s new Office of Sustainability, which coordinates and oversees projects aimed at reducing the university’s carbon footprint. Both Hoffeckers are involved with the campus’ organic garden, but their efforts extend much farther into the campus community and beyond, into Greater New Haven. Meg chairs the Residence Life Sustainability Committee established by Rob DeMezzo, interim housing director, this year. The committee just held its first annual Fall Sustainability Programming Series as part of its commitment to working with departments across the university to engage students in making healthy and environmentally-conscious decisions in all aspects of campus life. The series kicked off with a presentation by the Hoffeckers that included an in-depth discussion of current campus sustainability initiatives, including the Plant It Forward Project and environmentally-sensitive transportation options available to students on campus. Other events in the series included a presentation on food by Danny Dawkins, resident district manager of Chartwells; an America Recycles Day event and a campus visit from chef Bun Lai of Miya’s Sushi in New Haven, who gave a presentation on sustainable sushi, along with a tasting. Meg says the committee is also working on facilities issues such as lighting and low-flow showerheads for the residence halls. The group is discussing a plan for a living space for an First-Year Experience (FYE) group that centers around the topic of environmental sustainability, as well as thinking about retrofitting a campus townhouse to be a state-of-the-art “green” living space. The committee is also considering ways to upgrade second- and third-year student housing so that a student could theoretically live in “green” housing for all four years of his or her on-campus experience. Jim explains that part of the Plant It Forward project is connecting New Haven residents with local food by showing them how to grow it in their own yards. He debunks a popular misconception that a large amount of land is necessary to grow food. Southern’s organic garden is the “size of a small yard,” Jim says, “and we have raised a lot of food there.” Plant It Forward was one of several initiatives from greater New Haven that were highlighted at a recent fundraiser to celebrate the 30th anniversary of the New Haven Land Trust, a nonprofit organization dedicated to land conservation, environmental education and community vegetable gardening in New Haven. Along with working with students in the garden, Jim coordinates the university’s Day of Service in the fall and the Big Event in the spring – Southern’s two largest community service initiatives of the academic year. The Hoffeckers are also members of the New Haven Bioregional Group, which sponsors walks, films, canoe trips, potlucks and other events to help residents of the Quinnipiac bioregion connect with their natural and built environment. Megan and Jim invited members of this group to do a presentation on growing corn in the campus garden. Working on sustainability projects such as the campus garden and the Residence Life sustainability initiatives represent their “personal passions,” Meg says. It’s easy to make New Year’s resolutions. The hard part, as many of you know from experience, is carrying out those resolutions over time. And now that the holidays are over and the new year is here in earnest, our wills are put to the test. The cold weather can deter us from our appointed rounds at the gym or the track. The party after work makes cake or chips seem more appealing than the carrots and celery sticks that we know we should be eating. And if a winter full of snowstorms, ice and hazardous driving conditions comes our way, our patience is bound to be frayed by the time March rolls around. So, except for those with an iron will, is it possible to make and actually complete our New Year’s resolutions? Yes, says Jim Mazur, a professor of psychology at Southern. Jim has conducted extensive research over the years with regard to choice making and impulse control. Develop a strategy. Even though the starting gate has opened for the new year, it’s not too late to make some early-year adjustments, if necessary. You know your weaknesses, so consider options that minimize the chances of succumbing to those temptations. If working out with a friend helps get you out of the house on those cold, dark nights, engage them with the idea. If you have a hard time saving money, consider automatic savings deduction plans. Enlist the help and support or a family member or friend. This person can help prevent you from cheating on your own rules. Knowing that this person is around will make it more difficult for you to eat that second slice of pie. Reward yourself frequently for good performance. This is especially important when you have chosen an ambitious goal. It may seem like losing 20 pounds will take an eternity. But if you break it up into 4-pound segments, it’s psychologically a little easier. Treat yourself to a reward when you reach those intermediate goals. Maybe go to a movie you wanted to see, or buy yourself a new piece of clothing that caught your eye. Set up reminders of your long-term goal. The problem with keeping many resolutions is that the goals are long-term, but the temptations are immediate. The way to help deal with those temptations is to post a picture or other reminder about your long-term goal. If saving for a new car is your resolution, you can put a picture of the car you want in your wallet so you’ll see it every time you go to buy something. Keep systematic records of your performance. This works well for those who have resolutions that can be measured in some way. Seeing your improvement over time can motivate you toward continued progress. It can also help put setbacks into perspective. Expect occasional setbacks, but keep moving forward. Progress rarely happens in a straight line. If you gained back 3 of the 10 pounds you lost over 3 months, you are still ahead of the game. It’s not unusual to fall down a few times, or even many times, in your quest. Those who are truly successful are those who dust themselves off and get back up. Please share with us any techniques you – or people you know — have deployed in making good on New Year’s resolutions. And remember, even if we only accomplish half of what we set out to do, we are that much better for it.